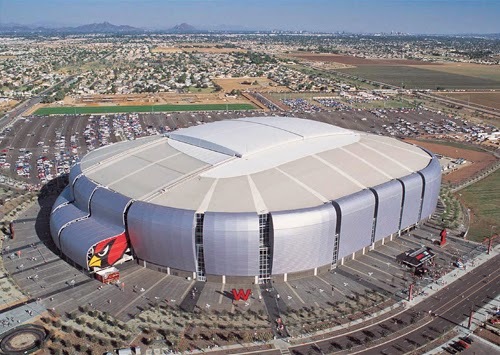 The 2015 Super Bowl is scheduled for Sunday, Feb. 1, 2015, at University of Phoenix Stadium in Glendale, Arizona. Super Bowl XLIX will be the third super bowl hosted by the Phoenix metropolitan area. It will feature last year's Super Bowl champs, the Seattle Seahawks, and the New England Patriots. The stadium, which accommodates up to 72,200 fans, is surrounded by parking lots with a total of more than 14,000 parking spaces, including 2,000 spaces for people with disabilities. Many of the spaces will go to sponsors and VIPs, but a portion of the parking spaces will be made available to verified ticket holders. NEW PARKING OPTION: Reserved parking also is now available at the Desert Mirage Golf Course adjacent to the stadium. 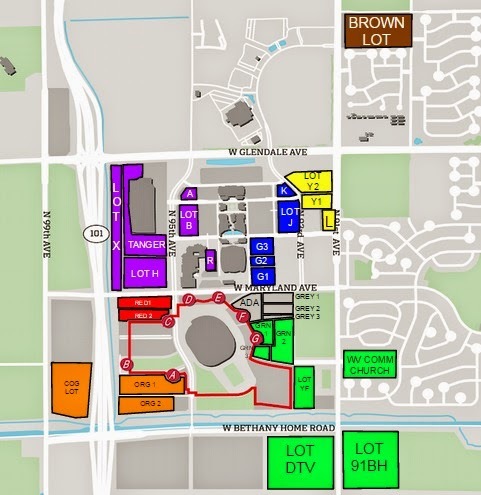 The spaces, which allow earlier access than NFL-sanctioned lots, are selling for about $130. You will immediately download your parking pass, or you can show it to the attendant on your smartphone. Need tickets to the Big Game? It has been a highly unusual year for ticket-price fluctuations and many marketplaces are no longer listing inventory online. Other game-day parking options that may be available on a first-come, first-served basis include the nearby Tanger Outlets ($60) and Westfield mall ($100). Those prices are per their website and subject to change. The Super Bowl experience has grown to encompass much more than the namesake game. Thousands of fans will soak up the NFL atmosphere without attending the actual game by visiting NFL Experience or Verizon Super Bowl Central, both of which will be held in downtown Phoenix. There are more than 27,000 parking spaces available in garages and along the streets of downtown Phoenix, though competition could get fierce for a space during peak times. A limited number of spaces are available for advance reservations. If you opt for a meter instead, rates are generally $1.50 per hour, and most meters accept credit cards. Looking for information on the best travel routes, taxi zones and accessible parking? Check out the Super Bowl host committee's transportation page. The excellent Valley Metro system of buses and light rail in Phoenix will be running extra routes to accommodate Super Bowl fans eager to attend the game and/or the related festivities. Get the full details on the enhanced service schedule here. A: This is the million-dollar question. 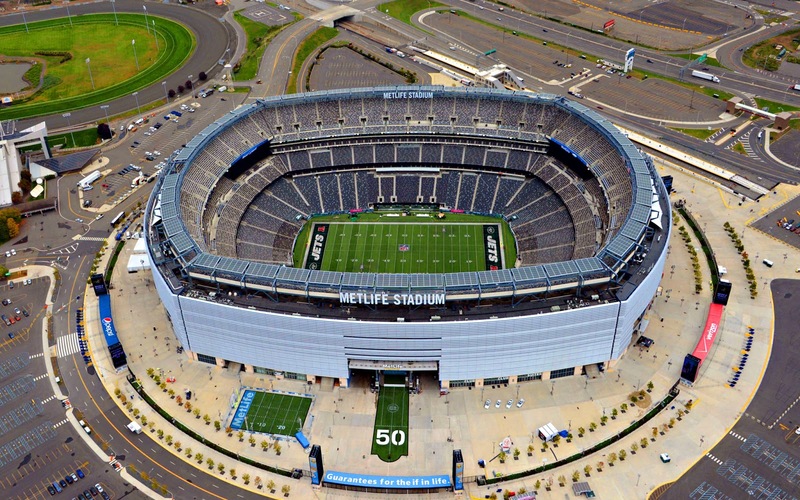 The NFL does not allow tailgating on any of its official lots, and most privately controlled lots have followed suit. We will update the site if reserved spaces come available. Meantime, you can use the links above to buy tickets for tailgate parties outside the stadium. Q: How do I arrange for a disability parking pass (ADA)? A: Find information on ADA parking for the Super Bowl and Pro Bowl here. Last update: Feb. 1, 2015.